About New Holland Coffee Co.
New Holland Coffee Co. was established in 2005. We are passionate about creating a welcoming atmosphere perfect for a chat with friends or a casual business meeting. 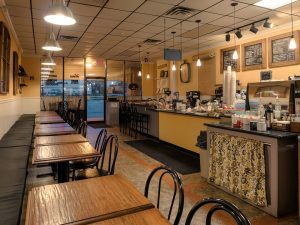 To provide for our community: a gathering place for all who want to experience high-quality coffee, delicious food, and excellent service, combined with an atmosphere that fosters conversation and connections to make it a thoroughly enjoyable experience. Conversations with our customers are a priority for our team. For us, it’s more than just giving you a cup of coffee and sending you on your way. We care about community building and want to do our part to share in the growth and success of our town. All of our coffees are roasted right here in our shop to provide you with the freshest coffee. You desire great service and we work hard to go above and beyond to exceed those expectations. We love having fun while we work, and we want you to have a great time too! 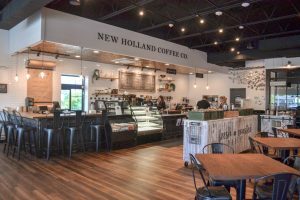 In September 2018 New Holland Coffee Company moved a few doors down to a newly renovated facility. We are happy to serve our community in more ways with this new space!